An Instagram contest is a great way to get more followers, build an engaged audience and grow your brand. However, if you’re not careful, your contest runs the risk of attracting the wrong type of people or completely flopping. The goal of your contest shouldn’t just be to increase your follower count. You want to build awareness for your brand and engage your current followers. 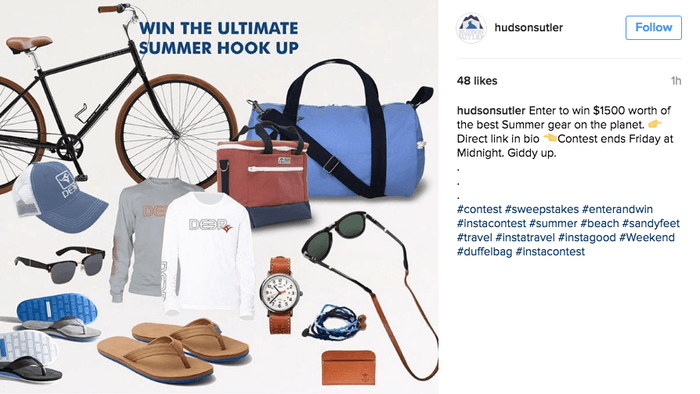 So before you start a contest and give away a free TV, here are some tips on how to run an Instagram contest that delivers results. First and foremost, you need to ensure you’re doing everything above board. That means taking a few minutes to learn the rules for Instagram contests. The last thing you want is to put time and effort into getting your contest running, then have it taken down for violating Instagram’s different policies. Your contest must include rules, terms and eligibility requirements. You have to make it clear that your contest is not sponsored by or associated with Instagram. While it isn’t common for Instagram contests to be flagged for a minor issues, you still want to err on the side of caution. Every contest you start should have a branded hashtag to go along with it. The hashtag will help you track entries and conversations about the giveaway. When you only use generic hashtags like #contest, it makes it nearly impossible to measure because there are thousands of posts using the same hashtag. But here’s the catch. You should still include those generic hashtags in your captions because you want your contests to show up when people search them. In order to make it clear that the generic hashtags are separate from your contest-specific hashtags, use line breaks to divide your caption. First list the information for your contest, including branded hashtags. Then list your generic hashtags at the bottom. Instagram is all about being visual, even when it comes to contests and giveaways. Your contest graphic needs to be engaging and eye-catching. If it looks like your image was made in Microsoft Paint, it’s probably not going to draw many people. Come up with a design theme or template. That way when you promote your Instagram on your website or other social networks, the branding is consistent. You can use a combination of Canva and Landscape to make a graphic that can be shared on Facebook, Twitter and other social networks. This is one of the most common mistakes companies make when running Instagram contests. They give away prizes that have nothing to do with their brand or industry because they think it’ll get more entries. Giving away Visa gift cards will probably get you more entries, but they’ll be much lower quality. Generic prizes tend to attract freebie seekers who aren’t interested in your company or products, and just want to get something for free. Instead of using cliche prizes that have little to nothing to do with your company, go the route of Monark and give away prizes related to your brand, or at least your industry. Some good options for prizes are gift cards to your store or free products. These types of prizes spread awareness for your brand and give people a chance to try your products and services. Entering your contest should be simple and straightforward. Having five different ways to enter can be confusing, and makes it more difficult to track the useful social media data. You should also clearly state the rules, and have a place to access them. You can include guidelines in the caption and also have a dedicated page on your website where all the information is listed. Being clear and listing the rules will cut down on the amount of questions you receive and keep your giveaway compliant with Instagram. Speaking of entries, you have a few different options for how people will enter your contest. Some companies prefer to have people reply to a post, while others will require you to like a photo or repost a picture. Generally the less you ask people to do, the more entries you’ll get. However, getting people to take some sort of action such as posting a picture and tagging your brand will generate more engagement and build your following. Ben & Jerry’s had success with its #Capture Euphoria photo Instagram contest. The challenge was to capture euphoric moments and include the hashtag #CaptureEuphoria. Even though the Ben & Jerry’s didn’t require followers to include its ice cream in their pictures, the contest ended up generating a lot of UGC for the company. The pictures participants submit should involve your brand somehow, such as including your product or logo. All of the photos will grow the amount of user generated content (UGC) your brand has on Instagram. UGC is powerful. According to a survey from Ipsos MediaCT and Crowdtap, UGC is 35% more memorable and 50% more trusted than other types of media. Instead of filling your Instagram feed with self-promotional posts, let your audience market your brand for you. How long should an Instagram contest last? That’s a common question companies ask, but there isn’t a “right” answer. Generally speaking, most Instagram giveaways last for around a week. A week leaves enough time for people to discover and enter the contest. Of course, this can vary. The problem with running your contest for too long is there isn’t a sense of urgency. If your contest lasts 30 days, people are more likely to procrastinate, or forget to enter altogether. Think about it–are you more likely to buy something from a store that has a sale ending in two days or two weeks? Also make sure the start and end dates are clearly stated. That way people don’t have to fill the comments section with questions about when to enter. Determining the winner of an Instagram contest is another hot topic with plenty of options. Public voting can be one of the best approaches because it creates a community and promotes engagement. Additionally, it allows contests to spread organically once people start sharing and telling their friends to vote for them. Not every user will scroll through your past posts to find your latest contest. If you post the contest on Monday, then post three photos per day for the rest of the week, your contest image or video will get buried. To combat this, you can include a sentence or two about your current contest in your profile. You can even add a link in your profile to more information if you’d like. Mentioning your contests in your profile is also great for brands that run multiple giveaways throughout the year. For instance, the health food company Luvo runs a weekly Instagram giveaway and promotes each with its own post. Adding this information to your profile makes it easy for users to identify your current contest, which prevents users from scrolling through all of your older posts. Avoid running Instagram contests for no reason. Your contests should be planned and well thought out. That starts with having a fun and exciting idea. You can do this by setting up a theme for your giveaways instead of the generic “like this post to win” approach. Some of the best Instagram contests of 2016 have been successful because they’re innovative. 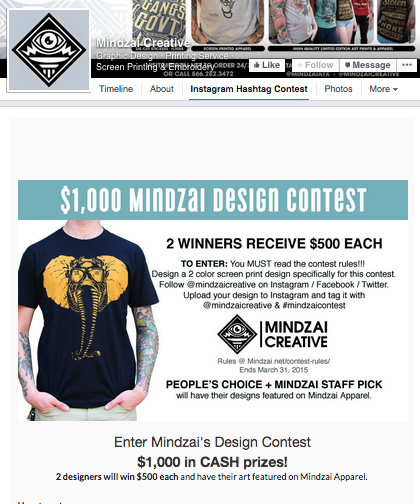 A great example of a brand that went against the traditional “tag us to win” formula is Mindzai Creative. The screen printing company held a contest that allowed designers to submit a new print design that would be featured on the company’s apparel. Additionally, the winners received $500 each. Think outside the box with your contest setup. Mindzai’s idea was great because it engaged users in two ways. First, this method allowed designers to submit their own work, and second, it let the public choose one of the winners. Managing contests on Instagram can be very difficult. Since there are no built-in giveaway features, you have to do everything manually including finding the entries, tracking votes and monitoring the conversations. These tools are great because they’re specifically built for photo contests, including hashtag integration. They also make it easy to promote your contest on your blog and other social media channels, as well as access your analytics. You also need to monitor the conversations taking place about your contest. 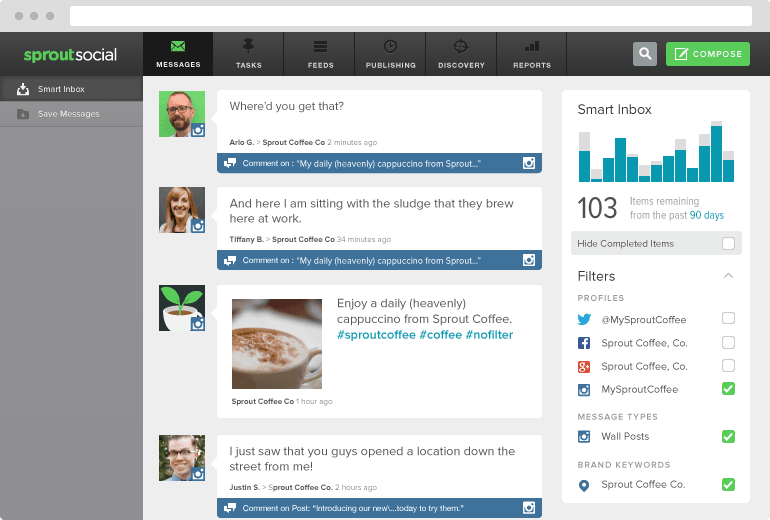 That’s when a social media management tool like Sprout Social comes in handy. Sprout has plenty of features to manage your Instagram contest. For instance, you can quickly reply to all of your comments, and even track your contest-specific hashtags. You can check out more of Sprout’s Instagram features here. Ready to Launch Your Instagram Contest? Whether you’ve had unsuccessful Instagram contests in the past or you’re eager to try it for the first time, the tips you’ve just learned will put you ahead of the competition. When done correctly, your Instagram contest can be much more than a way for people to get free stuff. It can be an effective marketing tool to grow your brand and build a strong community on Instagram.